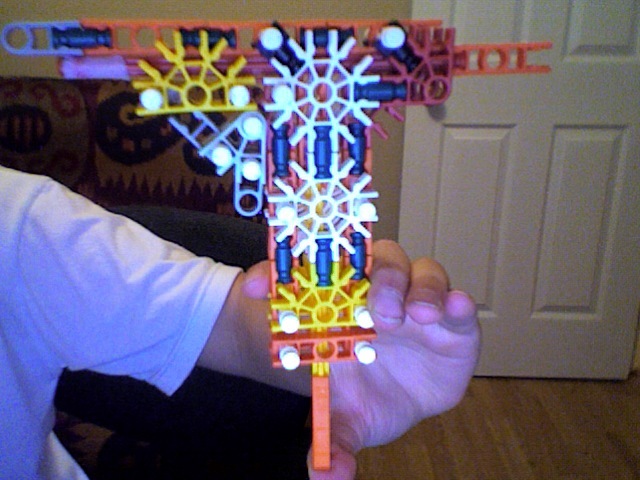 For discussions, guides, and instructions for K'nex projectile launchers. Today we have a fun, shorter history lesson. This was a brief competition a few of us builders had because I was "compettitive" (petty + competitive). If you read up on my TDS series, then you're familiar with the Mini-TDS. It was just for fun and remained uncontested (as far as I know) the smallest repeater for a while. The above picture was actually a slightly improved version. I made it after someone else had designed a more compact repeater called the OKP. Unfortunately, the original instructions and pictures are gone, but someone else mostly copied the design and scaled it up a little. The OKP was the new smallest repeater, and though I improved my Mini-TDS, it still wasn't smaller, and I just couldn't let that remain the case for long, so I set out to make an even smaller repeater. El Mosquito was caught in an awkward spot of not remaining the smallest repeater for long, nor was it really functional enough to recommend building, but still I left up its instructions just in case. It was solely designed to edge out the OKP, because I'm competitive like that. That said, the OKP was a more functional design more worth building. I vaguely recall some other competition from something called "The Tick" by "Big Z" on Instructables. Now we were getting into bragging rights territory. These things started barely working, just spitting out pieces in a pathetic attempt to be deemed a launcher. That said, he did technically succeed in making something even smaller. I think I was already working on my own design at the time that just barely won out dimensionally. Behold the "Nano". I was actually quite pleased with this launcher and will still rebuild it to this day. It's still pathetic, but it works. Rest assured, even smaller "launchers" were built that were difficult to hold and loaded only one more projectile from the "magazine". Because, again, I was petty, I'd argue about the validity of calling them repeaters or how they didn't really have handles. Simple fact of the matter is that they beat me, but I was content with the Nano for still remaining surprisingly usable. And after that we never really cared about mini repeaters again.